Interdisciplinarity is an inflationary concept in the discourses of higher education and science policy. Yet, some recent structural reforms in European and US universities reflect fundamental changes in the organization of knowledge production and teaching. 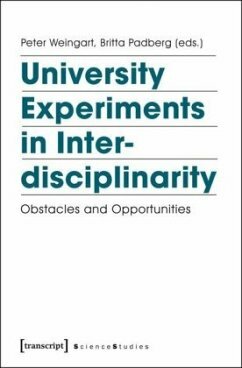 This publication takes a fresh look at the meaning given to the concept of interdisciplinarity with these reforms. It presents examples of different forms of interdisciplinary research and teaching. These case studies are put in the broader context of reflections on developments in the organization of universities and their implications for knowledge production. Peter Weingart (Prof. em. Dr.) is former director of the Institut für Wissenschafts- und Technikforschung (IWT) of Bielefeld University. From 1989-1994 he was the Managing Director of the Center for Interdisciplinary Research (ZiF). Britta Padberg (Dr.) manages the Center for Interdisciplinary Research (ZiF) of Bielefeld University.